Dimensions(LxWxH):14.5" x 5.5" x 13.4"
Function:Crossbody Bag & Handbag & Shoulder bag. 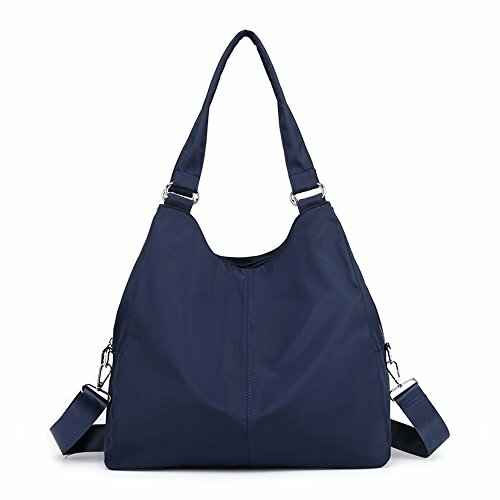 This tote bag is made of nylon, washable and durable when you using.and rustproof metal hardware zipper,easy to open and close. Multiple pockets can holding lots of your daily necessities such as mobile phone, wallet, ipad, umbrella and so on. Bag have a short handle straps and a long removable shoulder straps.easy to change to be different occasions with different wear methods. Simple and Fashion design make you Elegant intellectual and prominent in your traveling, shopping and party. Super using space with zipper closure.Innter zipper pocket and Big compartments will place your daily supplies orderly.A great choice as a gift for your friend,family and dearling. - About color:There might be a little color difference due to the monitor, camera or other factors, please refer to the physical item. -natural odor at first is normal,but the smell will disappear after a couple day airing. ❤ TOP ZIPPER & QUALITY MATERIALS The full length top zipper keeps your items safe and secure, making sure nothing will fall out.Made of waterproof material,and stain resistant nylon fabric that is durable,lightweight,high quality, easy to care for wipe clean or machine wash.
❤ LOTS OF POCKET & EXTREMELY PRACTICAL A Main Zipper Compartment is convenient for opening，Interior: 1 zipper pocket and 2 open pockets. Exterior: 1 back private zipper pocket. It can hold a 13.3" MacBook Pro, tablet or a laptop 12" and under. Exterior pockets can hold your iPad/Smartphone/Water Bottle/clothes/books/pens/wallet/umbrella and other essential items. ❤ MULTIPLE USE & A GREAT GIFT Come with a long adjustable shoulder strap, you can use it as a shoulder bag，handbags or a crossbody bag. Perfect to wear when go shopping,parties and travel .Great gift idea for your friends, wife, parents or yourself.